Mauricio de Souza has been directing/performing with his Brazilian jazz, Bossa Brasil, since 2004. 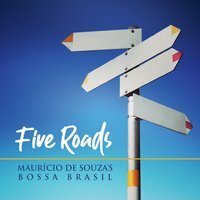 Five Roads is his fourth commercial album. For this project, de Souza decided to record mostly his own compositions. He composed a variety of tunes in different styles of Brazilian music, such as Bossa Nova, Baião, Samba, and a modern Maracatú. The tracks feature his quartet with Andrew Beals on alto sax, Bob Rodriguez on piano, Gary Mazzaroppi on bass (all studio tracks), Charlie Dougherty (live track), and Mauricio de Souza on drums. As a huge fan of classical music, de Souza decided to record his arrangement of Schubert's, "Ave Maria" (as a Bossa Nova). The group also recorded his arrangement of Roberto Menescal's, "O Barquinho". Thank you for reading and please also look up my other albums: "Here. There...", "Different Directions", and "Trajetórias". More details on Mauricio de Souza and his group can be found at www.mauriciodesouzajazz.com.